Dr. Emmett Price spoke about music and Martin Luther King’s legacy at the Unity Breakfast. The Rev. Martin Luther King Jr. often used music to help get his message across, and Monday music played an integral part in the 15th annual Unity Breakfast in Watertown. Keynote speaker Dr. Emmett Price, an associate professor of music at Northeastern University, spoke about the role that music played in Dr. King’s Civil Rights movement. Before he spoke, those in attendance at the Hellenic Center enjoyed some traditional gospel and spirituals sung by Dr. Francois Clemmons, who studied at Oberlin College and taught at Middlebury College. 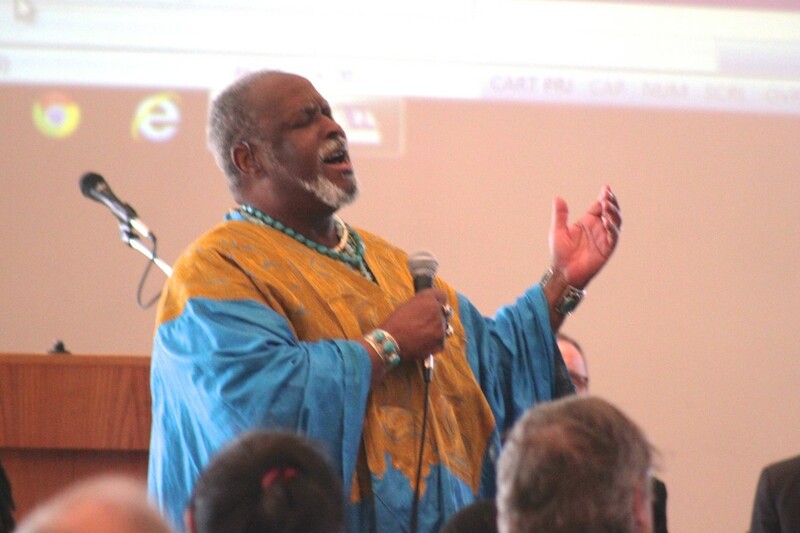 Dr. Francois Clemmons wowed those at the Unity Breakfast by singing traditional spirituals. Price told those at the Unity Breakfast that Dr. King’s image sometimes overshadows the real man. In his youth, Price said, Dr. King had a mischievous and defiant side, but he went on to do extraordinary work. “You have the opportunity to be called to do great things like he was,” Price said. If he were alive, Dr. King would be fighting for those who do not have quality education, quality health care and against violence and bullying, Price said. He encouraged people to pick up MLK’s torch. The Unity Breakfast was presented by World in Watertown, and during the ceremony the group honored Watertown resident Deborah Peterson with the 2015 Unity Award. Peterson has been active in the World in Watertown, Watertown Citizens for Peace, Justice and the Environment and Trees for Watertown. She also helped organize the effort that has produced two murals created by Watertown High School students working with a professional artist. Students from Watertown Middle School’s Kingian Nonviolence Project displayed their artwork depicting six principals of MLK’s non-violence movement and a group of students performed a rap in King’s honor. 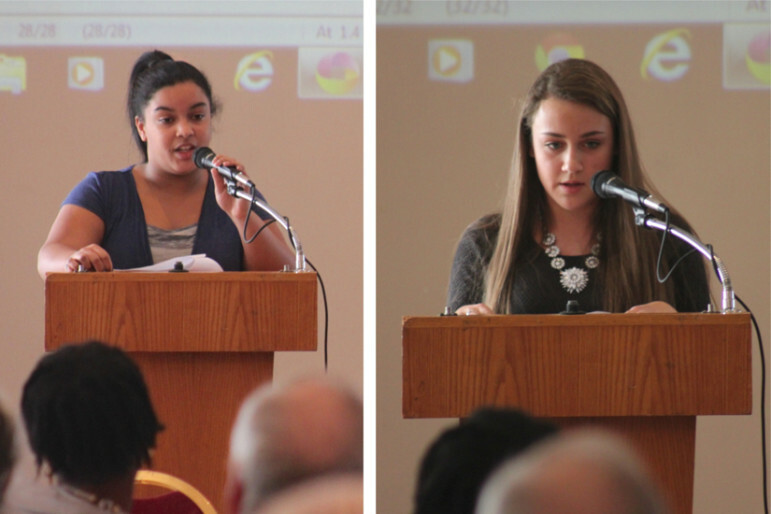 Two Watertown students – one from the middle school and one from WHS – read their essays about MLK’s legacy. Their works were chosen from 68 essays entered into the competition. MLK Essay contest winners: Watertown Middle School student Olivia Beauvoir Haggerty, left, and Watertown High School student Lauren Petrillo. Eighth-grader Olivia Beauvoir Haggerty wrote about what it is like growing up as the daughter of a mixed-race couple in the Boston area. Lauren Petrillo, a ninth-grader shared her experience traveling to other towns with the Watertown youth basketball team and playing with a teammate who wore a hijab – traditional clothing for Muslim women – when she played. Students have been participating in the Unity Breakfast and the associated essay contests at Watertown Middle and High Schools since 2010. Thanks to the efforts of Paul Moreton (our liaison with World in Watertown), students have been presented with essay topics that both they and community members find relevant and important. This year, over 300 students entered the contest and 68 made the final cut to present to the essay committee. Olivia and Lauren eloquently discussed what they experienced–but issues like theirs are representative of what our students handle with sensitivity and resolve every day. Thanks to the outstanding educators of Watertown Public Schools along with parents, neighbors, clergy, and community leaders, we are raising wonderful young adults that find that the insensitivity and hate prevalent in older generations to be totally foreign to their experiences and patently offensive.